I've been keeping an eye out for pink lady's slippers (Cypripedium acaule) ever since I started photographing in the DC area. I used to see lots of them in western Massachusetts and I knew a couple of very reliable places, but I've never had good luck in the mid-Atlantic. Last year I found a location at Prime Hook National Wildlife Refuge in Delaware after the blooms had already gone by, but this spring I just don't have the stamina yet, to make a 6 hour round-trip drive worth it. So, this past weekend, I made a concerted effort to find some blooming pink lady's slippers in Shenandoah National Park and the surrounding area. From internet searches (see my post on how I find good places to photograph nature), I knew of a few general locations to look. I hiked several locations with no results. In one location, I found leaves with no evidence of any past or future blooms (way past; deer browsed; too early; not in reproductive shape; I'm not sure what the situation was). In most locations I found no evidence at all. Brief excitement at the top of Stony Man Mountain faded when closer inspection revealed everything I was momentarily excited about to be Clintonia leaves. I know plenty of locations for yellow lady's slippers (Cypripedium parviflorum) in Shenandoah and the Blue Ridge Mountains, but I just wasn't having any luck at all with their pink cousins. My last chance was a bit of a long shot. A relatively long hike, with not much else to photograph, worsening light, possibility of getting caught in a thunder storm, and little hope of finding anything. I pushed on anyways. My morale got lower when I found leaves again, not far down the trail, with no evidence of any blooms. I continued onward for almost two miles and found yet more leaves without any evidence of blooms. I was beginning to think that I'd be skunked again this year and I was nearing my turnaround time (I'd promised my wife I'd be back by noon and I wanted to leave two hours for driving in traffic). I almost gave up. But I decided to push to the very end of my turnaround time, as I hadn't reached the end of the ridge yet. At the very end of the ridge and just as I reached my drop-dead turn around and hike back time, of course, I found two perfect flowers. I don't know if I've "captured the essence" of the pink lady's slipper yet. The light was tough, their positions weren't great for photography, and I was a bit more rushed than I like when doing macro photography (as it was, I was about 40 minutes late getting home). At least, I got some decent images and now I know a reliable location. I guess the moral of the story is that a nature photographer needs to be persistent. Often the conditions are rough, or at least not what we wanted them to be. The weather isn't cooperative and the weathermen are almost always wrong. Often the wildlife is not cooperative; it doesn't show up or bloom where and when we want it to. If we don't have the stubbornness to keep photographing, to keep hiking, to keep looking for that elusive subject, to keep coming back; then we are unlikely to succeed in our endeavors and make more than the occasional "lucky" shot. 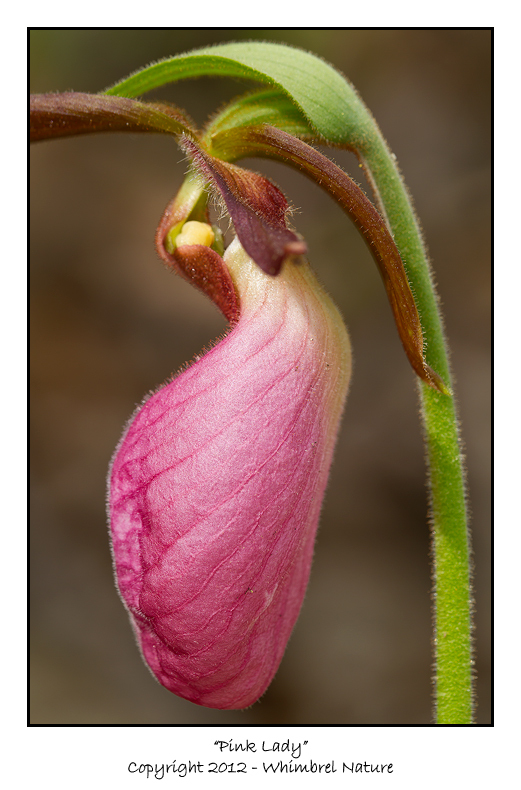 Persistence and Patience pays off with nature photography and your Pink Lady Slipper images are evidence of that. They are one of my most favorite wildflowers and I used to practically sing when I'd find them in the woods. You captured this "Ladys" essence wonderfully! I love the texture of the "slipper" portion of the flower. Beautiful!